This arrived in my mailbox yesterday with the title " Why the Dog Left"-- forwarded by a friend. I thought it might give you all a week-end laugh. I'd leave too if I were a dog-- or maybe even if I weren't a dog:-) That is some huge pussycat. How absolutely huge and adorable!!! Oh my. I hope he likes to snuggle, he'd make a great pillow or throw. Can you imagine the sound of his purr? ps your feedburner is on the fritz. Is that a cat...or a lion? I'm glad I'm not the one paying for the cat food bill... Yikes! Wow! That's some picture. Reminds me of Leo the Lion! I'm not really anonymous. I guess I hit the wrong button. Did someone think if one kitty vitamin is good, two must be better? I suspect ALL the dogs in the neighborhood have left. Yikes! 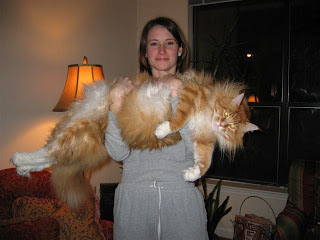 This cat is giant! Looks nicer than Garfield!